I must have been 12 or 13 years old the first time I tasted a wild strawberry, picked roadside on a country lane out on Long Island, New York in the late 1970’s. I was visiting for the summer and my Sister and family had/has a small summer cottage there. One day, my brother-in-law took us out on a walk and started bending over and picking up the most amazing miniature little wild strawberries I have ever seen or tasted in my entire life. They were quite small, perhaps the size of a pea at most, but they were packed the most incredible flavor and sweetness. After an hour of back-breaking work, you were lucky to have a couple of palms full of berries. But that didn’t matter, these were completely wild, completely free, and unlike any strawberry I would taste for many many years… And if you made them into preserves as Sister once did, they would definitely be on your Top 3 preserves/jams EVER tasted. 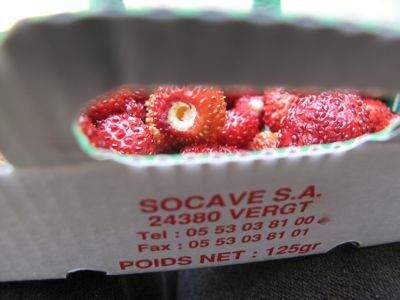 So many years later, on a trip to France, I came across these “Fraises des Bois” or “Frais du Bois” otherwise known as “wild” strawberries or forest strawberries. I bought a teeny tiny container of them and shared them with Mrs. MM and The Kid (maybe 7 years old then) and we have all distinctly remembered that experience. The berries were delicious. But I must say, despite their being tiny, say the size of your pinky nail and the finger meat behind it, these were still “cultivated” wild strawberries, in other words, raised in farms, or greenhouses,not just gathered in the wild… They were outrageously priced then, and they continue to be outrageously priced now. But like caviar, you don’t need that much and you don’t indulge that often. is it just me or are the seeds also red? whoa! must try. banana, that’s interesting, they do in fact look red! I don’t recall, but the photos are not retouched, so maybe they were red! Sarap naman nyan! i wonder if they can grow this variety in Baguio. What a wonderful trip MM! Been a lurker for sometime. Two things that made me quickly react are your Baguette de Foie Gras at Bon Marche which I also had the luxury of indulging some years back and would soon have again in July when we visit Paris. Definitely an indulgence worth having! 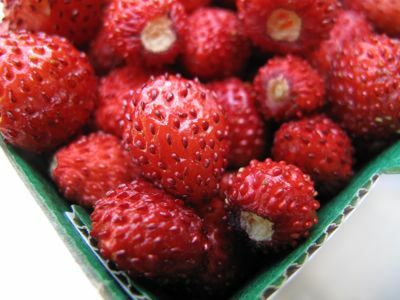 The other thing is your today’s post on wild strawberries – the Swedes have a name for it – smultron. And it does evoke the best of summer memories. I still remember the almost heady combination of forest smells and the sweetly distinct smultron somewhere on the sides of the forest path. It’s a Zen-like experience. And if one is lucky to find some summer chantarelles after picking a handful of smultron, then it’s heaven on earth! STRAWBERRIES,,,Nice fruits! 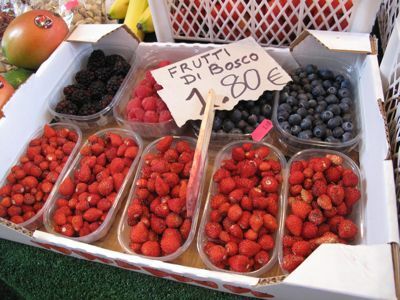 those berries are quite small in sizes or they were just classified? its a seasonal plants that does not want too much rain. but those smaller ones are more aromatic and sweet than the bigger ones indeed. what i hate on berries are its seeds, it stucked between the teeth! it will pursue you to clean it with strings otherwise meet the dentist..I have some packets of seeds with me still! want to get them? anyone? they were french origin too thought i get it from morocco few months ago.. I too shall worship in the altar of Genetic Modification if those busybody scientists can somehow, with their bags of tricks, mercifully tamper with the pale disproportionate super-market strawberries and reverse engineer, whatever, inject back into them some semblance of the wonderful untamed intense flavor of fraise du bois that horticulturist seemed to have bred out of them for commercial consideration a long time ago. Usually found in patches around forest borders here (in Northern Ontario) unlike the wild blue and black berries that flourish along the lakeshore and the fiddleheads for which you have to venture into the forest thicket itself or the open market at CAN$4.99/lb. Cute little berry.. But tasty and flavourful nonetheless..
What a wonderful post! I will have a lookout for these. Risa: if you manage to come across the YELLOW ALPINE STRAWBERRY gather them, too! 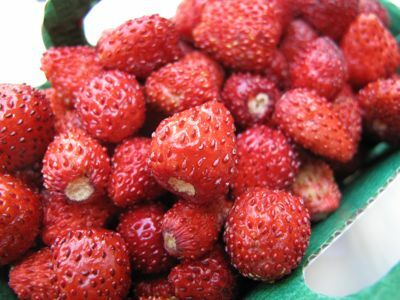 ….sweetness to the max and has a good punch of strawberry flavour just like their RED WILD STRAWBERRY SISTER!!!!!! we have clumps of Alpine strawberries in our backyard. But we have to compete w the birds for the fruits! When I’m lucky enough to get a handful, I just give them a quick wash & then gulp them down – hardly a mouthful. I keep telling my husband to propagate them, but his precious flowers overpower them! Vicky: put a netting over them so you don’t have to compete with the birds! or if you don’t have a netting, some sort of cover cloth will do like Remay!…will protect them from SLUGS as well! Somewhat off-topic, but has anyone tried to grow fiddlehead ferns? I first tasted these in Hawaii, and I understand that they grow wild in the Philippines as well. I live in Berkeley and still have room in my veg boxes. Jess…I think the fiddleheads grow in shady areas…picture them on the forest floor being protected by the towering trees. Maybe Kurzhaar can shed some light on the ideal growing conditions. i had the wild strawberries under the roses–the birds can’t get to them. they do smell really GOOD! 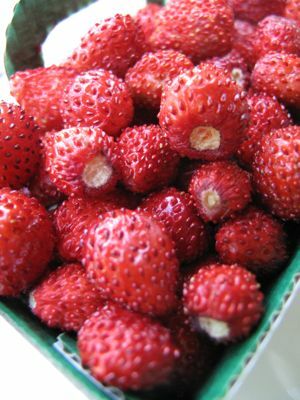 I found wild strawberries at Union Square last weekend for the first time in 20 years of shopping there. They were tiny and delicious- $6. a scant half pint or $24. a quart. Had to grab four before the Gramercy Park produce guy bought the rest of the less than dozen half pints, and I ate most of mine on the way home. We haven’t gathered strawberries in Quogue in 15 years ever since the shoulders of the roads have been mowed regularly. Hi Jess and betty q, I must say that I’m not a huge fiddlehead fan. As far as I know the fiddleheads I’ve seen in farmers’ markets back home in California and on the east coast are wild harvested. On the east coast I have seen cinnamon fern harvested and eaten by locals..it’s a very common wild species (and also a common ornamental in many yards) so I do not know if anyone bothers to plant it specifically for fiddleheads. Anyway, regarding growing them–like most ferns they will like shaded sites with fairly constant moisture. I have wild ferns (several species, including cinnamon) growing on my property under oak and maple trees. I’d suggest ordering species known to be edible from a good plantsman. Don’t collect from the wild unless you know what you are doing–not just to collect the right species but to not damage areas where you collect. Just like mushroom hunting. I do know that there were cases in CA both in the bay area and in the LA area where people were poisoned by either improperly preparing the fiddleheads or eating the wrong species. strawberries are my favorite fruit of all time next to mangoes. these looks absolutely mouthwatering and the color is so vibrant wow! Oh, Sister…Sometimes I splurge on fruits such as these alpine strawberries. Hubby would sometimes cringe let’s say if I buy a case of mangoes at $56 a case. But then again, I usually tell him…OK, I will just process or bottle the $56 and he can spread it on his croissant the following morning!!! Hi Betty q, what mangoes do you buy for $56 that is worth its flesh in gold? We do get a case ( 10-12 per depending on size) of the Mexican ones that are sometimes labeled as ( stolen identity of ) Philippine type mangoes for $14 when in season and when they are at their best. Still does not come close to our kinalabaw but are sweet and not fibrous as the other varieties. And I do have wild strawberries in my garden, some growing as large as the nail of my pinky and often wonder if they are edible. I often times wish I could eat them, for what a pity that I have to keep weeding them out from my ornamental patch. Doc, they are the ones that are identical in taste as Silly Lolo would say…from the ‘Pins! …it comes every Friday and once in a while, I would have a hankering for those…to make JAM!!! They are grown in Mexico but not the Ataulfo variety. they are a bit longer than the regular Mexican mangoes but the skin or peel is very identical to the ones we have back home. My friend/distributor only brings it in when I ask him for its shelf life is not as long as the Mexican ones. But it is worth the $56!!! It comes in a 20 pound case. Yum! Wild strawberry plants started growing in my garden this year, to my surprise. I just gathered a handful of these chickpea-sized fruit and the flavor is indeed sweeter and much more intense than regular strawberries. betty q—champagne mangoes here in bergen county,NJ (similar sa ‘Pins) 2 for a dollar!!! $7.99 a box!! (didn’t count how many/box)…just bought a few since i wasn’t sure if they were sweet, but they are!!! will buy more today..
Ahaaaay ,betty Q ,now you are getting me into jam making…..nevermind that there is a diabetic in the family and one in the making. Guess what I was doing at 3 AM? Googling how to make jam and found this wonderful site complete with all the how to’s I would need, source, down to the computation of cost to make an 8 oz jar of strawberry jam. Might be useful as a project for an eco tourist community in Palawan using native fruits instead….tamarind, camias, santol, etc. Now to get ready for the blood, sweat and tears give aways for the holidays. I appreciate even more the precious strawberry jam that came with the tin package. And did you say some hating kapatid share on the way?….but don’t worry. I am not being presumptuous. Hey, that is a good idea, Connie C….it would be an awesome cottage industry there! For diabetics, you can use splenda …first buy the NO SUGAR ADDED PECTIN, comes in a white blue and red markings….Bernardin brand not Certo is what I use. Fro sweetener, you can use fruit juice or Splenda. It would help if the berries are really sweet. I just finished making another 2 cases last night and I will mail you 1 case for now next week so you can enjoy it on your toast or biscuits or scones or croissants. How about preserves, too….mango preserves, atis? But it would be a PAIN de-seeding them. or Santol pickle! …much like the pickled mango I remember which is sortof sweet pickle. This reminds me of our summer home in scandinavia. We have raspberries and blueberries growing wild. But next to my son’s sandbox is a little patch of strawberries. Makes me smile just thinking about it. Betty Q, Are you referring to the “Champagne” mangoes, sometimes labelled “Manila”. I read somewhere that the original seedlings were transported to Mexico from Cebu on a Spanish galleon. I think they are the best availble in the US in May and June- $17. a dozen in one case of large ones- they are very good. Sister: I googled champagne mangoes. The picture is identical to theones we get here labelled Manila mangoes (Ataulfo variety). That one is in season here now and my friend /distributor sells it to me from anywhere from $30 to $46 for a 40 pound box when there is a bumper crop. Howver, he also sometimes brings in the ones that looks EXACTLY like our Mangoes back home. The skin is smooth and when ripe, the color is PALE YELLOW (just like our mangga back home) unlike the Champagne ones …the skin is DARK GOLDEN YELLOW almost orange when ripe. The shelf life is not as long as the Champagne ones. That is why he doesn’t bring it it unless there is an order for it. I must be the only oddball who asks for it. never had the chance to have wild strawberries. The closest that I had are those bought from supermarkets but I guess the sweetness are no where near the wild ones. The wild strawberries (markjordbÃ¦r in Norwegian)here are now ripe for the picking. I also have some under the hedge (plus some hedgehogs grunting and snorking at night) and I am a bit curious if you will agree that they have a hint of aratiles in them (not the hedgehogs, huh). Just as I found blueberries have a hint of santol; morell cherries taste like duhat, and cranberries taste like…must be my tastebuds feeling homesick. But then again, there is free food to be gathered, so I must not mope.I also found that I will be having sukker plommer—uh, yellow plums, this summer. Plus the endless rows of wild raspberries along the path where I walk my dog, I only pick the ones above urine level of the largest dog I know, or I forage below urine level after the rain has stopped…Hey, did you know that gooseberries taste a bit like kamias?…There’s a kind old lady two streets up from where I live and she has a hedge of blackberries, nam-nam…Eat your heart out, Marketman!